I have the happy challenge of needing to communicate with students over the summer. Most of them are incoming first-year students or transfer students who are trying to decide how they will spend their time at Connecticut College. This means quite a few questions regarding the types of choral ensembles that we offer, how often the ensembles meet, the types of literature we study, and audition requirements/times. During my first summer teaching at Connecticut College, this meant writing pretty much the same response over and over. I got into the habit of keeping several stock responses in a separate Word document so I could cut and paste the details. I am happy to say that I found a more efficient way to keep in contact with these incoming students! 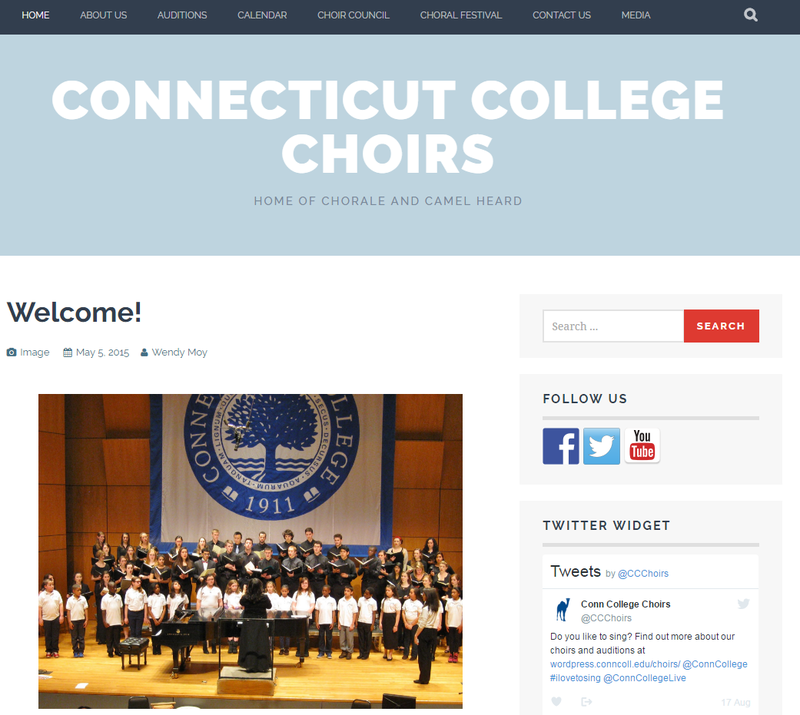 I created a choir website in WordPress during the Tempel Summer Institute. For incoming students, it describes our choral program, the audition process, and a way to sign up for an audition slot via SignUpGenius. For the current students, it describes volunteer opportunities and how to contact the choir council. For the greater community, it contains information about participating in our high school choral festival, attending upcoming performances, bringing a choir to an event, and joining the Chorale (open to students, faculty, staff and community members.) For the greater community, there is a media page with YouTube videos and Livestream videos of past choral performances. I am currently working to build an audio portfolio that will feature audio clips via SoundCloud. During the month of July, I have the email vacation autoresponder tell all incoming messages that I will get back to them shortly and to visit the choir website for more information about our program. My incoming students now have a better idea of the philosophy and scope of the choral program (and I get my month of July back). Prospective students can also visit this website to see what musical opportunities we have to offer before they apply. Lastly, this website is a storehouse of information regarding community engagement events that I can easily share via social media (Twitter, Facebook). While time intensive in the beginning, a course website can help you communicate more effectively and also build a community presence. I highly recommend it!